Each week Charity Navigator stops in a new state to highlight some of the highly-rated charities there. This week, more than ever before, we wish our cross-country tour wasn’t just figurative. We’d love to be soaking up on the sun on a Southern California beach or hiking through the redwood forests of Northern California, rather than bundling up to face New Jersey’s frigid winter. Did you know that in addition to its diverse landscape and unique cultural hubs the Sunshine State is also home to nearly 1,000 3- and 4- star charities? We’re excited to share a few of the great organizations serving the people, communities, and environment of California. Montalvo Arts Center is an oasis of culture and nature that fulfills its mission by creating and presenting arts of all types, by nurturing artists, and by using our historic Villa, buildings and grounds in innovative ways that engage people in the creative process. Nearly 200k people enjoy Montalvo's programs annually, including year-round concerts and gallery exhibitions that draw a wide variety of music and contemporary art lovers. Our Education Program, which enables students and teachers to work directly with renowned professional artists, serves 20,000 K-12 students each year, many of whom come from low-income backgrounds. The Sally and Don Lucas Artists Residency Program is committed to connecting local, national & international artists-in-residence with the community. In advance of each residency, we work with artists to plan education and outreach activities, which may include performances, exhibitions, lectures, commissioned projects, as well as master classes for youth. Families Forward was founded in 1984 by a group of dedicated community members who shared the same vision of providing supported housing programs for families in crisis. Families Forward assists families in financial crisis to achieve and maintain self-sufficiency. We do not just provide support; we supply the tools for families to move from depending upon public services to return to being independent, productive residents of the community. At Families Forward, we give families renewed self-confidence and the tools they need to succeed in life. Last year, Families Forward assisted over 6,000 individuals through housing, counseling, food, referrals, school supplies, career coaching, and other services. Orange County Coastkeeper (Coastkeeper) is a nonprofit clean water organization that serves as a proactive steward of our fresh- and saltwater ecosystems. We work collaboratively with diverse groups in the public and private sectors to achieve healthy, accessible, and sustainable water resources for the region. We implement innovative, effective programs in education, advocacy, restoration, research, enforcement, and conservation. All people have the inalienable right to clean water. Coastkeeper promotes and restores water resources that are drinkable, fishable, swimmable, and sustainable. Tipping Point Community is a non-profit organization committed to fighting poverty in the San Francisco Bay Area for the individuals and families too poor to meet their basic needs. We support the development of new poverty-fighting solutions by providing grantees with the risk capital and tools needed to think big. We connect grantees with best-in-class pro bono partners to provide services and expertise that many groups could not access on their own. We collaborate with the public sector to leverage our impact and create scalable change. WiLDCOAST protects and preserves coastal ecosystems and wildlife in the Californias and Latin America by building grassroots support, conducting media campaigns and establishing protected areas. WiLDCOAST was founded in 2000 in order to protect some of the most ecologically important coastal wildlands, islands and marine areas that remain in California and Baja California. Since its inception, WiLDCOAST has successfully protected more than one million acres of coastal wildlands and halted the development plans of illegal mega-resorts throughout the Baja California Peninsula and the Sea of Cortez. Through its innovative conservation campaigns, WiLDCOAST has brought critical attention to pressing environmental issues in the Californias. Empowering students. Strengthening families. Building communities. Preparing Los Angeles students for success in college, career, and life. Working through a network of high-performing, community-based schools, both traditional public and charter, as well as a portfolio of programs that reach students throughout the County, our organization creates vibrant community hubs and partnerships that foster motivated, engaged, and directed students poised for academic, professional, and personal success. LA Promise Fund is a unique hybrid, operating John Muir Middle School, Manual Arts Senior High School, West Adams Preparatory High School, LA's Promise Charter Middle School #1, and LA's Promise Charter High School #1, while also implementing high profile programs and engagement opportunities available to students and teachers across Los Angeles County. The Coalition for Clean Air is committed to restoring clean, healthy air to all of California and strengthening the environmental movement by promoting broad-based community involvement, advocating responsible public policy and providing technical expertise. The Coalition for Clean Air was founded more than 35 years ago, at a time when clean air in California seemed almost unimaginable. From spearheading California's original Smog Check program, which reduces 100 tons of automobile pollution every day, to strongly supporting and helping pass California's landmark global warming laws, we have helped position California as a world leader in reducing air pollution. 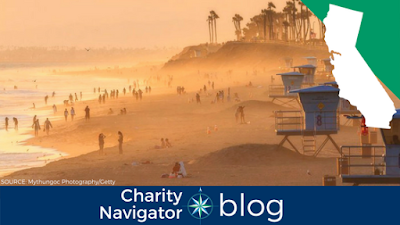 You can use Charity Navigator’s Advanced Search Tool to find even more highly-rated charities in California. And, if you’re interested in supporting a charity working with the recovery efforts following the 2017 wildfires in Northern and Southern California please take a moment to check out our California Wildfires Hot Topic.